Already own a home in the Lakes subdivision? Thinking of selling? Click here and read about current search trends & our web network. 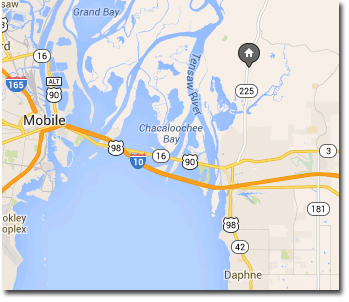 The Lakes subdivision is located in the far North side of Spanish Fort, AL. The proximity of homes in the Lakes makes trips to the area's larger cities, like Mobile, AL and Pensacola, FL fairly straight forward and easy. All of the area's airports are located in these two larger cities along with a wide range of restaurants, shopping venues and area attractions. The Lakes is close to the Tensaw River area also making outdoor activities a staple of the community. Homes in the Lakes subdivision are typically large and range from 2,400 to 7,400 square feet historically and prices have ranged from just under $200,000 to well over a million dollars and close to two million dollars. With some of the state's favorite cities in Fairhope, AL and the beaches of the Alabama Gulf Coast a short drive away, it's no wonder the homes for sale in the Lakes community have been well-received. Please let us know if you would like further info on the Lakes or any other homes or real estate in the Spanish Fort area or would like to schedule a private viewing by emailing info@condoinvestment.com or by calling 251-Area-Pro (251-273-2776) for immediate assistance.